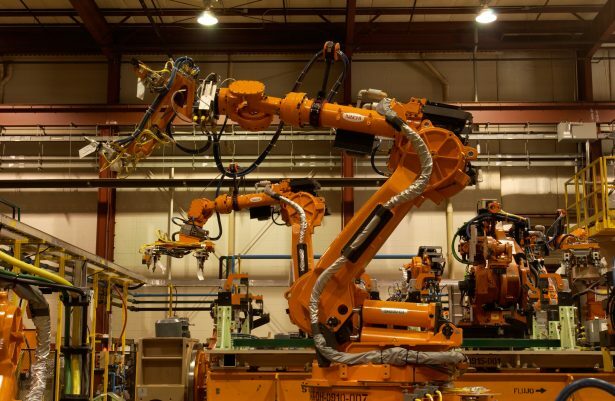 Whether the proposal comes as an internal idea or a customer request for a new product, industrial equipment manufacturers experience intense pressure to deliver a fully functioning product when it ships out the door. Using an integrated product development solution, like SOLIDWORKS, can help them accelerate time to market, while reducing costs and ensuring greater safety and reliability of machines. SOLIDWORKS can help engineers and machine designers streamline the development of industrial equipment as they go through each step of the design-to-manufacturing process shown below. Click on image to see full-size infographic. Assemble a team to review the proposal request. Your team of engineers, purchasing and manufacturing must work together to answer several questions about how to address the design challenge and whether existing assets can be leveraged. SOLIDWORKS PDM is one piece of this puzzle. Once you answer the questions, you can easily develop the proposal using SOLIDWORKS tools for configurations, risk assessment, cost estimations and product drawings and animations. When the proposal has been accepted, a detailed design team can work concurrently to finalize the design, integrate electrical components, verify performance, manage design data and collaborate with manufacturing. Getting to manufacturing, whether in house or at a separate facility, is easy with SOLIDWORKS tools that leverage your CAD data to output the specific information needed by manufacturing and for the shop floor. You can also provide 3D product manufacturing information (PMI) and automate creation of inspection documents. Finally, the existing 3D design data can be re-purposed to rapidly create high-quality graphical assets to create user manuals, field repair documentation and marketing content to promote your product. These are just a few examples of how SOLIDWORKS plays a role throughout the process. 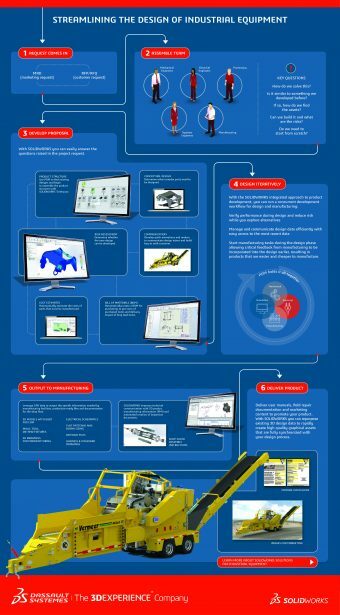 Check out the infographic to see the Industrial Equipment workflow in action. Learn more about the individual products that contribute to the integrated design to manufacturing process with demo videos on the Industrial Equipment Library.